Shooter is a popular slang term for the street version of craps. There are differences between street craps and craps in the casino. On the street, there is no banker covering the bets, so it is up to individuals to cover and keep track of bets. There is also no table, so it is difficult to keep track of the more complicated bets that you see in a casino. As a result, most street dice games are based purely on the "pass" and "don't pass" options. This simplifies the game and makes it more conducive to the streets. 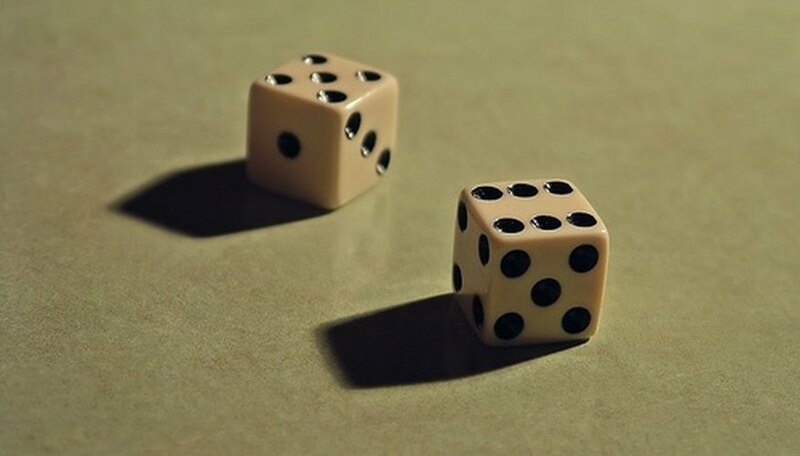 Begin by allowing the shooter (person rolling the dice) to place a bet on either "pass"or on "don't pass." In the most basic terms, betting "pass" means that you are betting that the shooter will be able to roll a point, then roll the same number again without rolling a 7 or 11. Betting "don't pass" means the opposite--that you expect the shooter to crap out. Start at the shooter's left, and allow each person an opportunity to cover the shooter's bet, or to cover part of the bet. If everyone wants in on the bet then it is common for everyone to cover an equal portion, although the person directly to the shooter's left could choose to cover the entire bet if desired. If only part of the bet is covered by the other gamblers, the shooter will have to either remove the uncovered portion, or else offer some kind of special odds incentive to convince someone to cover the rest. Complete all other bets. After the shooter's bet has been covered, other gamblers will have an opportunity to place additional side bets. This is typically done by those who did not cover part of the shooter's bet placing wagers against those who did. The shooter's roll can begin once all bets have been placed. Roll the come out roll. This is the first throw of the dice made by the shooter. If the shooter rolls a 7 or 11 on the come out roll, then all "pass" bets are won. If the come out roll is a 2, 3 or 12, then all "don't pass" bets are won and the shooter's turn is over. If any other number is rolled (4, 5, 6, 8, 9 or 10), the number becomes the "point" number. The shooter's objective is now to roll this number again. Continue rolling. Unless the shooter crapped out with a 2, 3 or 12, he continues rolling the dice. The object is to roll until the point a 7 or an 11 is rolled. If the point is rolled, the "pass" bet is paid and the shooter starts his turn over. If a 7 or 11 is rolled first, then the "pass" bet loses and the shooter's turn is over. Pass the dice. After the shooter's turn is over, the dice are passed to the shooter's left so that the next person can have a turn. This person can choose to either take a turn rolling the dice as a shooter or can decline to roll and continue passing the dice to the left. Either way, a new shooter begins a turn, starting over at Step 1. Street dice games are notoriously crooked. Loaded dice are commonly used, and robberies are not unheard of. If you want to play craps, your best option is to go to a casino where you are guaranteed to have a fair game in a secure, regulated environment.